Just checking up, but are Sky Dolch still being shipped out? Appears so, I just got my notification last night. As for the Sky Dolch, we are one fifth done with the shipping. We still need to get a lot completed, and we are working on shipping everything out as soon as we can. If anyone has lost interest in their set, I have GMK Carbon or GMK HyperFuse I would be willing to trade! Thanks again to Sherryton and Originative for putting this together!! Supremely excellent GB and set!! eat_the_food color matched really well! Wow, no joke! ETF is (no surprise) a freaking boss. Just ordered one from the marketpalce! So glad I'm able to get my hands on this set! It's look amazing. Any chance extra modifiers will go on sale? Thanks again for all your hard work bringing an awesome site like that. Same here. I kept checking kbdist for updates in general and then found out about the sky fugus through some reddit comments..
A few keys of the E profile rows (function & numbers keys) had some issues in the back, however, where one of the four "flanges" (which limits key attachment dephs to the switches) where smeared about, particularly raised above the plane of intended depth limit, resulting in these keys being raised higher than its neighbours, when attached to my keyboard. 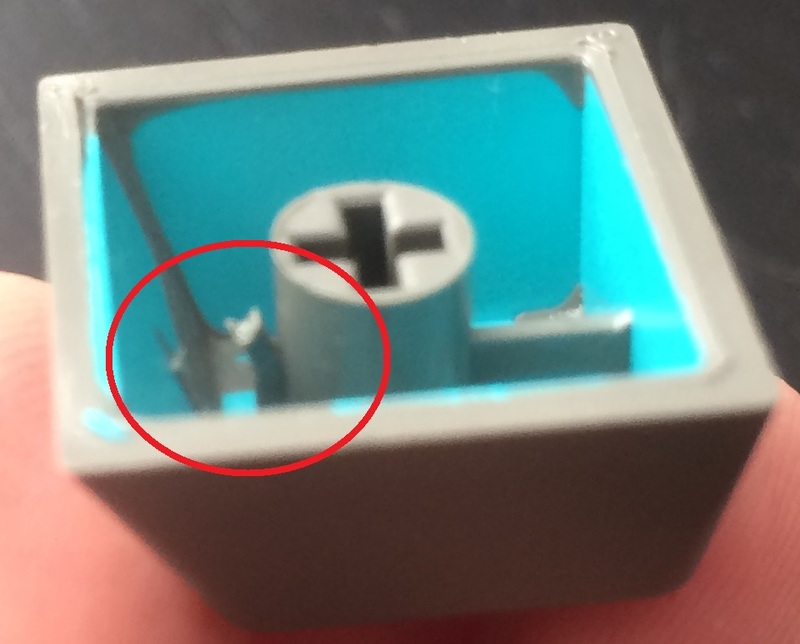 I noticed that this particular flange (the one directed towards the user of the keyboard, for each key), when not smeared about, seemed to be present for some keys, and absent for other, so I assume it isn't necessary that this flange is present, given that the remaining three are intact. Is this smeared flange situation common, and something I should attempt to correct myself (sharp scissor etc)? I haven't ever "worked" with GMK plastic, so I don't want to attempt some fix that might brittle-kill the whole mx stem slider. Or, is this a manufactoring issue that should be prompted to request replacements? There's a chance I'm super stoked about that! I have came up with pricing and this is what we are seeing. Please add in if you want to see the kits together or separate! It seem there is confusion to all the accent kits. They were all made and they should be ready with the Sky Dolch. Estimated shipping date is 3/28. I couldn't pass up on those accent kits, because I've been wanting these since I got the Sky Dolch set in. Just a quick question, what are the "Sky Dolch & Sky Dolch Accessories" vs. "Sky Dolch Kit"? This excludes the Sky Dolch Accent Kit. Just got the set in and it looks gorgeous! I did, however have a couple of issues. I also had a couple of keys that had the extra bit of plastic underneath that caused them to stick upon bottoming out. The standard spacebar had some unfortunate scratches on the top of it right out of the box. Should I send something in through the regular Contact page on the Originative website? Thanks for looking into it. This is the colorway of my dreams and I'm super happy with every other part of the set. Apparently my package (#7230) arrived yesterday (it didn't). I'll give it another few days (probably until Tuesday), maybe they just scanned it early (or it ended up at the customs office again:( ) if it didn't arrive by then I'll message support again, it's like Skeletor all over again . Got mine . Now I have to decide between Hydro and Sky Dolch! the set in and it looks gorgeous! I did, however have a couple of issues. I don't have the broken bit of plastic sticking up on mine but I do see that the whole set has either 3-4 flanges or just a half molded (derp) 4th flange on a handful of my caps. Checking against my GMK TA set; I don't see this non-uniformity present there. I'll check my GMK Skeletor set when I get home. You may want to call your regional customs office. The way USPS tracking are done, they mark the packet as "Delivered" once it has been handed over to the local mail handler (In your case it's probably Deustche Post or something similar). Oh yeah, I got a similar letter on saturday, already picked it up on monday. Me too. I'm in the UK. We need to start a GB for this key. That and a 1u dark grey tilde key. Hey Sherry! Will there be extra sets of the Magenta Dolch up on the store? Will there be another GB phase for Sky Dolch or is it just going to be stocked in the store from now on? Yeah, there'll be like a group buy / pre-order phase.